Rated PG-13 for graphic monster gore. Carrow Narby is a writer and doctoral student based in Boston, Massachusetts. They are still very new to the world of fiction. Ever since they can remember they have been fascinated with monsters, and their work tends to explore what it feels like to be, or to be seen as, a monster. 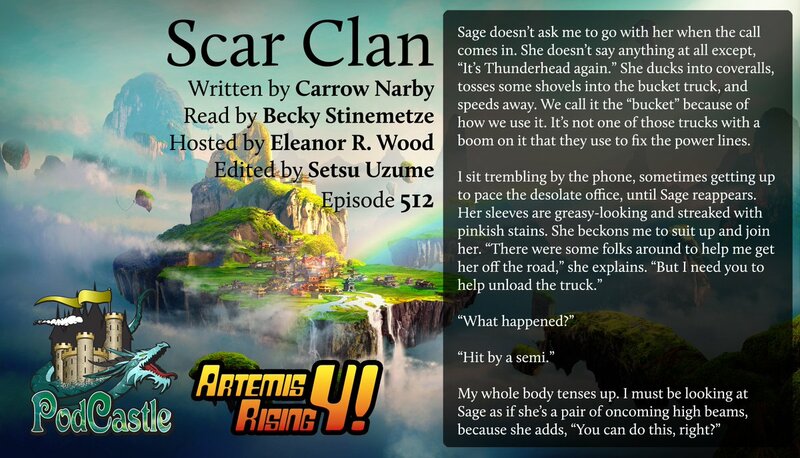 Becky Stinemetze has narrated one other story through Escape Artists on Pseudopod. She also lends her voice to other projects when she is not working at her marketing job in San Antonio, Texas. She is married and has one daughter. She spends a lot of her time chasing her toddler around, working, watching addictive TV, and of course do voice over work. She is working really hard to one day be a full time voice over artist. If you wish to contact Becky about any voice over work of any kind or if you just want to follow her antics; you can find her on Instagram at BeckyStiney. Isn't it awkward when you see people you know from work out in the real world? Anyway I loved this world where werewolves with superhuman healing powers are only kept secret by veterinarians in the know. I love that the protagonist was able to work through her trauma by putting herself into similar situations rather than avoiding it. I want more from this world. More urban fantasy! This was super not my cup of tea. There was just a lot of stuff that didn't feel well thought through. Why do the werewolves need a clinic if they're immortal? Is it just to keep them secret from the masses? If so, that seems super sketchy. Shouldn't people be aware of the dangerous wild animals wandering around the woods? Isn't lack of appropriate caution the reason our protagonist was bitten in the first place? How common are werewolf attacks in this world? The text seems to imply that the main character has been bitten more than just the two times we know about. Is that common? Am I supposed to feel sympathy for Thunderhead when she shows up in her human form? Build a cage in your basement or something!! Every time she goes out in wolf form, she's endangering lives. If nothing else, she has a reputation for attacking other werewolves, and her bite seems to negate the magical healing abilities of other shifters, or they wouldn't need a vet to sew them back up afterward. Also, on a metaphorical level, the message seemed muddled and problematic. I get the intention. However, she was physically assaulted by a dangerous person who can't control their violent impulses as a child. Then, she grows up to seek out and befriend the same kind of person who traumatized her in the first place. It felt a lot like the same cycle of abuse that leads survivors to end up in relationships with people who treat them no better than their original abusers. I agree with most of what angrykebler said. Every time she goes out in wolf form, she's endangering lives. Yeah, there is no way werewolves would be protected by vets and unregulated. If you are a chronic and serious danger to other people, you need to be controlled. It doesn't matter if it is accidental or you don't mean to do it. I appreciate that the protagonist is forgiving and working to understand more about werewolves, but putting yourself in harms way like that is just reckless. You could at least wear gloves or something if you must pet a confused and injured werewolf!